Search “whole grains and health” on google and you’re sure to find opposing views within the first two articles. One person swears “research” supports that whole grains are inflammatory and damaging and another claims that eating whole grains with every meal is the only way to be healthy. Neither extreme is accurate. Hopefully by now you know I don’t agree with labeling any food good or bad. Food is food. And it’s my job to teach people how to eat in a way that’s satisfying, enjoyable and nourishing. For this to happen, all food must have a time and a place. Sometimes “fun”, highly palatable foods help satisfy us and bring enjoyment to eating. And sometimes incorporating nutrient rich whole foods helps us feel our best as we power through our day. All of these foods play a role in our overall health and well-being. As a dietitian, it's my ethical obligation to provide evidence-based nutrition recommendations; to look at the research and separate supported nutrition claims from anecdotal food rules. That’s not to discount the individual experience with eating. If a certain food is shown to have health promoting factors, but makes you feel poor or just isn’t appealing to you – you don’t have to eat it! But to be honest, there is a lot of food out there that we've convinced ourselves is“bad”. We eat that food in fear and stress, certain that the resulting stomach ache is from the food, when maybe it has more to do with the anxiety produced by eating it and the very real physiological stress and inflammation that the anxiety brings. There are of course other reasons why food might cause digestive distress and inflammation for certain people. And if this is something you struggle with, I would encourage you to seek care from a non-diet dietitian who specializes in digestive issues. But first, let’s seek to remove fact from fiction, evidence from anecdote, truth from fear. 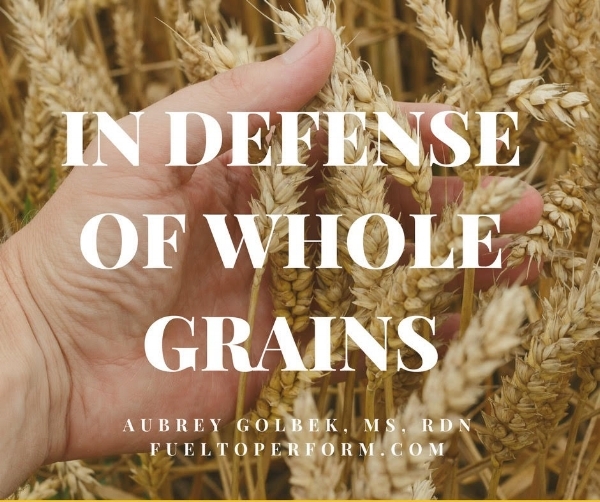 Today, I’m putting on my dietitian hat to present the evidence for and against whole grains, to dispel the myth that whole grains are harmful for everyone and to provide recommendations for incorporating (or not) whole grains into your diet. A whole grain is the unrefined grain seed. It's made up of the endosperm, germ and bran, whereas refined grains simply contain the endosperm. The bran in whole grains is a good source of fiber, B vitamins and trace minerals iron, magnesium and zinc. The germ contains antioxidants, vitamin E and some B vitamins, while the endosperm provides energy from carbohydrates and protein. It's important to note that the processing of whole grains to make cracked, crushed, rolled, extruded or cooked grains does not remove the germ and bran and should result in the same nutrient profile. Whereas refining grains does remove germ and bran. What does the research say about whole grains? The vast majority of research studies provide evidence that whole grain consumption supports a healthy lifestyle. According to a recent review of whole grain consumption and disease risk published in the British Medical Journal, whole grain consumption is associated with decreased risk of coronary heart disease, cardiovascular disease, respiratory illnesses, infectious diseases and type 2 diabetes mellitus, as well as with decreased risk of all-cause mortality. Whole grains and the fiber they provide have also been found to decrease the risk of colorectal cancer. The authors of this review note that there is not enough evidence to support a specific dose recommendation of whole grains. Proponents of avoiding whole grains, claim that they are inflammatory. Yet research shows the opposite-- whole grain consumption is inversely related with inflammatory markers. Again, whole grain opponents state that whole grains are not as nutrient dense as other sources of carbohydrates. While this may be true, I’d argue that just because a food contains a larger ratio of calories and carbohydrates to micronutrients, does not mean it shouldn’t be eaten. For people who lead busy active lifestyles, or for those with increased energy and carbohydrate needs, like athletes, pregnant and breastfeeding women, and people with diseases that increase their metabolic rate, it’s impractical and sometimes impossible to meet nutrient needs without foods that are dense in carbohydrates and calories. Consuming fruits, vegetables and beans may meet the carbohydrate needs of a person with low to moderate energy needs, but likely won’t be enough for the above people groups. Overall, the research supports the consumption of whole grains as a part of healthy diet and negates the idea that whole grains are “bad” for your health and should be avoided. On top of this, consider that grains are a more economical option than many other carbohydrate sources. Dry grains keep for a long time ( 6 months to a year ) and are extremely affordable. For example, on average brown rice only costs $0.50 to $1.00 a lb. And like I alluded to above, grains provide significantly more energy and carbohydrates per pound than vegetables, which means they go further in feeding a family. It would be a shame if a family with limited finances avoided this economical and nourishing food group just because somebody instilled in them a misplaced fear of whole grains. If you enjoy whole grains, and/or suffer from or have a family history of heart disease, type 2 diabetes, colorectal cancer or respiratory disease, by all means, incorporate them into your diet! Whole grains fill the carbohydrate role on your plate. There is no specific quantity of whole grains that you have to eat. In fact, you are still free to not eat whole grains at all – this is your party after all. You may like whole grains with every meal. Or you might eat them occasionally and choose to have potatoes or fruit or beans in place of whole grains for your carbohydrate. The moral of the story is that there is no reason to fear whole grains and they could serve to make meals more satisfying, enjoyable and nourishing! Americans eat most of their whole grains from whole wheat bread and whole grain cereal, but there are countless other varieties of whole grains to try. Brown and wild rice, whole oats, barley, millet, quinoa, rye, buckwheat, bulgur, couscous, and corn are all whole grains, and each has a unique nutrient profile, texture and flavor. So like I mentioned above, if you’re someone who really doesn’t like whole wheat bread and pasta, you don’t have to have it! You can still incorporate whole grains by trying one of the many other variations. You can add cooked whole grains to almost any recipe. They absorb flavor well, giving you the option to make them savory, spicy or sweet, and serve them warm or cold. If you’re buying whole grain products like bread or cereal, ensure you're getting the most whole grains for you buck by looking at the ingredient label. If the first ingredient is 100% whole grain ____, then you're getting a dense source of whole grains. This doesn’t mean that grain products that aren’t 100% whole grain are bad or off limits. Actually, for some people, the extra fiber of whole grains may not be tolerated. For example, athletes eating right before a race may need energy that is quick and easy to digest, so a refined carb would be a better choice. Or someone who has just had bowel surgery might benefit from laying off the fiber until they heal and so should stick to refined carbohydrates. Again – All foods fit and have a role to play for someone at some point! Honoring your body with gentle nutrition that makes you feel and function your best is an important part of caring for your health, but we are ALL individuals and making sweeping nutrition recommendations for everyone based on what foods work for you is a dangerous business. As a nutrition professional it’s my job to publicly present the recommendations that are WELL supported by the research and to privately work with people on an individual basis to find the specific pattern of eating that is most appropriate for them. Hopefully this serves to clear the air a little bit for whole grains. If you enjoyed this, I would love to hear from you; what nutrition topic are you confused or curious about? I might just do a post about it. Until then, happy fueling, and stay nourished!